I received my copies of the third printing of the Swords & Wizardry core rules from Lulu a couple of months ago. Shortly after receiving my copies, I wrote up some initial impressions, but – akratic individual that I am – I never got around to posting them. Since S&W will be going into distribution soon, though, I thought that I might as well post them now. Better late than never, eh? The interior illustrations and layout look pretty much the same as the second printing. There is one new illustration that I noticed (on page 22). It is an attractive book, on par with Chaosium’s Basic Role-Playing (2008) in terms of layout and art. I certainly consider it decidedly superior aesthetically to Troll Lord Games’ Castles & Crusades core book (at least the first, second, and third printings). Not bad, considering most of the work was done free of charge! Ø The Fighter and Dwarven Adventurer saving throws start at 14 (as does the Elven Adventurer when in ‘Fighter’ mode). Ø The Cleric saving throws start at 15 (as do those of the Magic-User, which are unchanged from the second printing). Ø Clerics have a bonus of +2 on saves versus poison and paralysis. Ø MUs have a bonus of +2 on saves against spells, including those cast from wands and staffs. Ø Missing spells have been added (including the much missed Stinking Cloud!). Ø There is an Appendix with the Thief (two versions) and Monk classes. All of the above changes, except for the new classes, also appear in the free PDF version. The special abilities for Dwarves and Elves remain too sketchy for my tastes. I don’t understand why the list of special abilities included in the ‘White Box’ version of S&W were not provided, even as an ‘optional rule.’ And Hobbits, err … Halflings, continue to lack a proper write up. Two versions of the Thief class are presented in the appendix. The first is the ‘standard’ thief, the version that we’ve known from the Greyhawk supplement onwards, albeit with some minor tweaks (e.g., a special ability called ‘delicate tasks’ in place of ‘pick pockets’ and ‘disable traps’). Any race can be a Thief, so that gives players who want to run non-human character an additional option. Racial modifiers are also provided, giving someone a reason for playing a Halfling in S&W. I was rather puzzled by Matt Finch’s decision to include a version of the Monk class, rather than the Ranger class, as I believe he originally had planned. The Ranger certainly seems more appropriate for the typical S&W ‘campaign ethos’ than a martial arts master. Nonetheless, I rather like the version of the Monk class that is included. The Monk shares a number of abilities with the Thief. However, I was a bit puzzled as to why a ‘simplified’ version of those abilities was not included as well (using the Monk’s saving throw as the target number for success). That’s such a painfully minor quibble, however, I’m almost embarrassed to bring it up. Also, personally, I would have appreciated a version of the traditional Basic D&D ‘Elf’ class in the appendix. The Elf ‘fighter-wizard’ is one of the oldest archetypes in D&D, but not one provided in the core rules for S&W (which requires Elves to choose between being a fighter or a magic-user on a daily basis – they can never be both). A modified version of the optional class from the White Box version of S&W would have been adequate. Yet again, ironically, the rules for the White Box version seem more fleshed out than the core rules for S&W, at least when it comes to the non-human races. 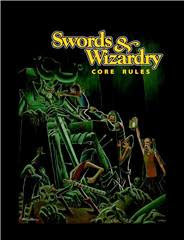 Overall, though, the third printing of the core rules book for Swords & Wizardry is excellent. The book is very attractive – superior in terms of layout and art than many professional RPG products, as mentioned earlier – and the rules are very clearly explained. Even more than before, S&W is my favourite ‘retro-clone’ RPG system, and I look forward to many more games in the future. Well done Matt and Mythmere Games! The third printing of Swords & Wizardry can be ordered from (the excellently named) Black Blade Publications. A quick announcement: the new issue of Fight On! is available! This one includes a modest contribution from yours truly. The cover by Pete Mullen looks brilliant. Deep under the misty mountains, the proudest and toughest keep Fighting On! Join us in those days of blood and plunder by picking up a copy of issue 7, dedicated to M.A.R. Barker and featuring EIGHT adventures, tables, settings, reviews, encounters, monsters, spells, magic items, new classes, non-canonical expansions to Empire of the Petal Throne, and much, much more! With art and articles by Akrasia, Mark Allen, Lee Barber, Baz Blatt, Calithena, Jeff Dee, Krista Donnelly, Allan Grohe, Zach Houghton, Gabor Lux, James Maliszewski, Peter Mullen, Stefan Poag, Alex Schroeder, Anthony Stiller, and more, this is one of the most beautiful issues we've produced. Take your game to the next level and buy it today! You can get the new issue at http://www.lulu.com/content/8047414 . Front cover by Peter Mullen. Back cover by Brad Johnson. Fight On! and Erol Otus logos by Jeff Rients. M.A.R. Barker photograph by Giovanna Fregni. Interior art and cartography by Mark Allen (portfolio.marjasall.com: 3,5,29,33,37,38,42,44,48,49,56,57,60,62), Matthew Riedel (4,7), Black Blade Publishing (blackbladepublishing.com: 5,37), Dei Games (deigames.com, 6), Anthony Stiller (7,40,41,42,43), Lee Barber (ghosttower.crithitcomics.com: 8 (logo),66,68,71,72,73,74,75,77,79), Kelvin Green (junkopia.net/kelvinsdirtybits/main.html: 8,88), Otherworld Miniatures (otherworld.me.uk: 9), Gabor Lux (10,11,12,13), Bill Hooks (14,15,36), Tita’s House of Games (tekumel.com: 15), Steve Zieser (19), Kesher (23,51,59), Alex Schröder (25,43,54,58,84), Baz Blatt (26), Coffee (27), Brian Isikoff (28), Jerry Stratton (www.godsmonsters.com; 30,31,32,33), Age of Fable (35), Martin “Istarlömé” Gillette (40), Peter Jensen (45,88), Jeff Dee (50), Talzhemir (51), Mikko Torvinen (64), Akrasia (65), Robert S. Conley (66), Ben Robbins (80), James Forest & Larry Whitsel (81), Stefan Poag (84), M.A.R. Barker (85), Joe Wetzel (86), and Eric Bergeron & Rob Kuntz (87). Thanks to the student essays and exams that are piling up on my desk at an alarming rate now that term in winding down, I will not have time to post anything for the next several days. Consequently, I thought that I would post this picture of Leif Ericson as a placeholder. The statue of Leif is a few blocks south of my flat in Milwaukee, on a bluff that overlooks Lake Michigan. 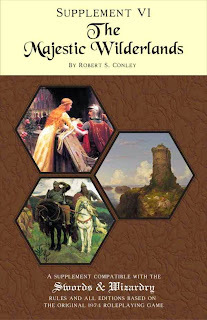 Robert Conley (author of the Points of Light setting books for Goodman Games) has just made available his version of the classic Wilderlands setting in his The Majestic Wilderlands (cover displayed above). 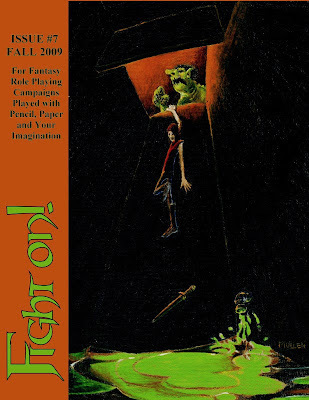 It is designed for Swords & Wizardry, although easily useable with any pre-3e version of D&D (0e, Basic, 1e, etc.). Approximately half of the book is devoted to new 'Wilderlands-based' rules for S&W (including new classes like 'Myrmidons of Set' and 'Rune-casters of Thor', new magic items, and so forth), with the other half providing an overview of the setting. If you're a fan of both S&W and the Wilderlands (I am! ), this is a product well worth checking out. More information can be found here.